A man from India's Dalit community has been hacked to death on a crowded road in a suspected honour killing in the southern state of Tamil Nadu. Police say Sankar, 22, was murdered for marrying a woman from a higher caste. She was injured in the assault. Her father handed himself in and admitted to carrying out the attack on a busy road in daylight, police said. Dalits, formerly known as untouchables, form the lowest rung of India's caste hierarchy. Sankar's marriage had been opposed by his wife Kausalya's family, who belong to a higher, more influential caste, the victim's brother, told BBC Hindi's Imran Qureshi. "Some months ago, Kausalya's family threatened us and afterwards, her parents and relatives came home and asked my sister-in-law to return with them. She refused," the brother Vigneswaran, who uses only one name, said. Kausalya's father China Swamy later gave himself up in a magistrate's court, police said. "He has told the court that he takes responsibility for the death of Sankar as well as the attack on his daughter," he added. Sankar's family have refused to take the body from the hospital until all the attackers are arrested. 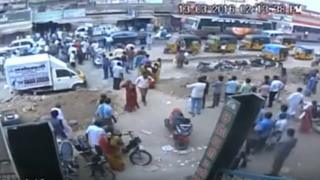 CCTV footage broadcast on Indian television channels showed the couple walking on a busy street in Udumalpet town, in Tirupur district, when they were attacked by three men armed with sharp weapons. People watched in horror as the attackers then fled on a motorcycle. The young man died on the way to the hospital, while his wife is recovering from the attack. Photographs of her seated on her hospital bed have gone viral on social media. The Dalit community in the town are protesting over the incident, our correspondent says. According to one study, hundreds of people are killed each year in India for falling in love or marrying against their families' wishes. In 2011, the Supreme Court said that people convicted of honour killings should face the death penalty.